How do I add special effects to MikuMikuDance? Where do I find special effects for Miku Miku Dance? How do I use MMD special Effects? What is MME MikuMikuEffect? Downloading and installing MikuMikuEffect is your first step to adding a wide variety of special effects to your MikuMikuDance tool box. Prior to creating my “Haruka Nana Dances the Sample.pmm” using Mason Williams’ “Classical Gas”, I had not used any special effects with MMD. MME is required before you can use effects within your MMD animations. 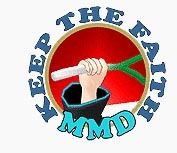 DOWNLOAD MME from the LearnMMD Downloads Page! My “Haruka Nana” video uses the NAMEPLATE Effect (You can find this effect at Mikudance.info, lower left column “Effect Links”) for the credits and the “Enjoy the Power” graphic. NAMEPLATE shows “placards” that you create as PNG files. For Best results your image must have a transparent background. Part of what makes the Nameplate Effect special is the fact that it always faces the camera. You can attach the placard to a dummy bone to move it up/down/left/right along the X and Y axis … but the Z axis does not move the image to or away from the camera. You control the size of what is displayed by changing the size of the graphic on your PNG image. This can be a limitation because the maximum size of PNG image is 512 x 512 pixels. I tried to use a larger, deeper image … but the image was squashed/distorted to fit the standard shape. I have discovered that you can adjust the Placard’s size by using the “Si” setting in the AMP panel … a larger number makes your placard larger! If you decide to download the NAMEPLATE Effect, be careful! This was given to me as a “Direct Link”, and still I had to go through two Japanese pages before finding the button to actually download the .zip file. Just keep your eye on the prize: watch for 196881 (which is part of the file name) and only follow the links with that number in them. It’s a small download, only 23k. Get yourself back to the Mikudance.info Help & Tutorials page to learn how to use Nameplate. I will soon be writing instructions to help you make your own PNG files using GIMP 2.6 … “Stay Tuned!” “:o). i put everything into the file and it still doesn’t work. i tried restarting my computer and that didn’t work either please help me i looked at the article but i need a more in depth explanation. Try downloading MME again and unzip the file directly into your MikuMikuDance_E folder. The MME files will be in the same folder as MMD itself. Open MMD again and the button ‘MMEffect’ should appear in the upper right corner of the screen. I couldn’t downloaded at first cause i had the las verion of MMD.. I have the 64 bit programme of MMD so I downloaded the 64 bit version of MME and it didn’t work, BUT I DOWLOADED THE OTHER VERSION AND IT WORKED!! MME is working foe old mmd only right ? No, it also works for the newest one. Make sure to download the correct version of MME and follow the simple drag & drop installation progress to the letter. And what *is* your video card capability? Is it an integrated IntelHD or a separate board? 3D graphics needs a lot of resources to process, and MMD is no exception. What does the error message say?? I read the instructions how to install MME and it says drag and drop files into miku miku dance.exe but there are no files in my mmd download that say miku miku dance.exe just MikuMIkuDancE_v926 and i tried draging and droping on it but when i click on the file it doesn’t appear. Hello Reggie, I don’t know if it is just the bunch of effects I downloaded. But my MME will not show effects, I used the black backround and still. My MMD is v9.26 if that helps and my MME is probably not the newest version v0.37 I think. do you see the little MME in the upper-right of your MMD window as per the “Success” picture in that article? Can you send me a list of MME effects because the blizzard effect for some reason wont work.HELP ME!!!!!! I tried my “Blizzard” and it works OK … I got it from the link in this article: https://learnmmd.com/http:/learnmmd.com/playing-with-mme-using-the-basic-effects-for-mmd-7-39/ … did you turn on the Black Background? The effect doesn’t look like anything against a white background. Lemme know if this helps! The site is in Japanese. So use a translation site or translation program, to get the file you need. Then go to the mikudance.info for installation instructions. how (here)do i get mme ?